Tank and AFV News recently had the opportunity to pose a series of questions to retired Marine Corps Lieutenant Colonel and professor of history Kenneth Estes. Mr. Estes is the author of several books on tanks and armored warfare, most notably his history of the development and role of AFVs in the USMC, Marines Under Armor. His other works include (but not limited to) Tanks on the Beaches: A Marine Tanker in the Pacific War (Texas A&M University Military History Series, 85.) , A European Anabasis: Western European Volunteers in the German Army and SS, 1940-45 , Into the Breach at Pusan: The 1st Provisional Marine Brigade in the Korean War (Campaigns and Commanders Series) , Marine Officer’s Guide, 7th Edition and also several Osprey New Vanguard series titles. Mr. Estes is a Seattle native and holds a doctorate in Modern European History from the University of Maryland. You had a long and successful career with the USMC, having held positions such as Company commander, instructor, historian and writer before retiring at the grade of Lieutenant Colonel (full career synopsis available at end of interview). Describe the beginning of your USMC career. I graduated from the Naval Academy in 1969, took the basic USMC officer course [The Basic School] Aug69-Jan70, attended USMC Tracked Vehicle School, Tank Officer Course Feb-Apr70. At the USMC Tank Officer Course, Camp Pendleton (1970), I trained on the M48A3, M67A2 and M103A2 tanks. This included firing the machine guns, 90mm and 120mm tank cannon and the flame projector of the M67A2. Normally each of us in that course would have preferred assignment to the U.S. Army course at Ft Knox, but only one officer per Basic School class was so detailed. However, the truth of the matter was that the USMC course was fully ‘hands on’ and personal training for just 10 tank officer trainees and therefore much more suitable, and I found out months later that lieutenants attending the Armor Officer Basic Course at Ft Knox in those years did not drive the vehicles and several missed gunnery because of range weather conditions. Moreover, the USMC Tracked Vehicle School was located at gorgeous Del Mar Basin on the coast near Oceanside CA, so one could enjoy all the merits of Californication. You either served or trained on the M48, M60 and M103 US tanks. What were your impressions of these vehicles? Well, by the time I came to serve in them, these were vehicles introduced into service in 1955-58, modernized in 1963-64 with most applicable M60 upgrades and once again rebuilt during the Vietnam War. So, they were very familiar to all hands and spares were available in the system. The principal difficulty was that the USMC supply system did not function very well in delivering spare parts to the units and particularly did not draw items well from the item manager [US Army]. Army provisioning of parts was much richer for units and we envied this. Over at the World of Tanks website, Nicholas “The Chieftain” Moran has posted an article written by historian Ken Estes about the career and experiences of WW2 era Marine tanker Lt. Col. Rowland Hall. Anzac Day is a day of solemn commemoration in Australia and New Zealand. The last time I touched upon this was two years ago, with a bit of background, and then an overview of one of the feats of arms of the Australian forces: The Defense of Tobruk. Those of you who have seen the miniseries The Pacific might remember an episode set in Melbourne. Australia’s role wasn’t just to send manpower and equipment to fight for the Crown. The country had a similar role in the South Pacific as the UK did in Europe: A bulwark to hold on the edge of the theater, a staging and training area for future operations, and a place for some R&R. Some time ago, Ken Estes sent me an article for the Hatch: the reminiscings of Marine officer Rollo Hall. Rollo’s writings do not focus on Australia per se — they are his view of the war as a whole and of the development of the Marine Corps tank force, but the amount of words he wrote about his time in Australia is indicative of just how important the country was to the prosecution of the war for the US, both in practical terms for combat training, as well as the morale effect of cameraderie with allies. This should give something of a holistic view of the general environment. So, I hand the keyboard over to the late Rowland Hall. For those that watched the “Inside the Hatch” video in the post previous to this one, you may have heard Nick Moran read a quote from a PS Magazine Article on the operation of the M56 Scorpion. We figured that was as good an excuse as any to hunt down the original article and post it here for everyone to read. This article comes from issue # 76 published in 1959. For those interested in the M56 Scorpion, rumor has it that next year Osprey will be releasing a New Vanguard series book titled “M-50 Ontos and M-56 Scorpion 1956-1970, US Tank Destroyers of the Vietnam War” by Ken Estes. And here is a video promoting the M56 Scorpion at the time that it went into service. 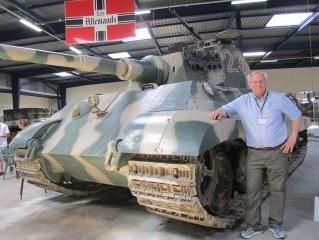 Over at the Tanknet forum, author and researcher Ken Estes recently posted about getting to examine the Tiger II tank at the Musee des Blindes in Saumur. He was there for their annual Carrousel, an event that includes a public exhibition of some of their historic AFV’s. Mr. Estes posted some brief observations on the Tiger II along with a few photos. Since the Tiger and Tiger II are such popular vehicles, we figured people would be interested in his comments. It’s surprisingly roomy inside, if you forget about the 70 rds of 88mm that were stowed in the hull sides forward of the engine compartment to the driver’s compartment, plus up to 22 more in the turret bustle. Tiger I had no main gun ammo in the turret and apparently the crews did not like to store rounds in the Tiger II turret, but the whole thing was an ammo box, and only the turret ammo would have been handy for loading. Perhaps because there is not a turret basket, there is much room for everybody but the gunner. I could stand fully upright in the loader and commander positions. Gunner and driver controls were OK, and I don’t know why the British found the manual traversing wheel awkward projecting into the gunner’s lap. Interestingly, there is a second manual traverse located in front of the loader, so he could add his energy as well to the traversing load. 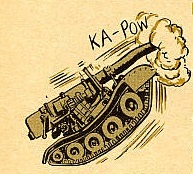 They should have had this in other tanks as well, especially heavies. My eyes popped out when I saw the 8 speed transmission shifting lever, but it is apparently as easy to drive as the earlier Tiger. Many controls are redundant, for instance braking is via foot pedals and the usual levers; must help a lot for panic stops. So well engineered I’d say, at first impression, but of course it’s hopelessly underpowered and overtaxed by terrain limitations for which the suspension could not handle. As with the M103, it likely represented the limits of automotive engineering of its day. Mr Estes noted that he took an extensive number of pictures of the vehicle which will be used for a book to be published in 2017. He has authored several books on Tanks and AFVs, including Marines Under Armor, Tanks on the Beaches, M103 Heavy Tank (New Vanguard) and US Marine Corps tnak Crewman 1941-45 (Warrior). While we were not able to find any videos yet of the 2015 Carrousel, here are some clips of the 2014 Carrousel, including the Tiger II tank (video 2).